If you’ve poked around the social media world at all the past few days you have probably heard about Flipboard, a new iPad app that creates a customized “social media magazine” based on what’s happening in your Twitter or Facebook stream (see video below). The app is already a raging success–it’s number one in the app store and Flipboard has been forced to restrict sign-ups until it can handle all the traffic coming its way. Now developers are working behind the scenes to make Flipboard even smarter with a semantic intelligence engine that will be able to select the content you want before you even know you want it. As it stands, Flipboard selects magazine content chronologically. It’s good enough for the time being, but hardly sufficient when trying to sift through content provided by, say, your 3,000 Twitter friends. That’s where Ellerdale’s semantic search engine comes in. Ellerdale originally planned to use its technology, which has been in the works since 2008, to build a personalized news website. But this week, the company was acquired by Flipboard as part of a bid to make even more customized social media magazines for users. Flipboard’s semantic search will take into account a number of factors: how closely a user is connected to other people (if you have an ongoing conversation with a Facebook friend, for example, that person will rank highly), posting behavior (you might not want to see content from a robot that posts every hour on the hour), common interests with friends (whether you “like” or retweet their posts), and how many followers a user has. That level of personalization isn’t easy. “We have a big database to cope with data streams. It can process 60 million messages each day,” Van Hoff says. 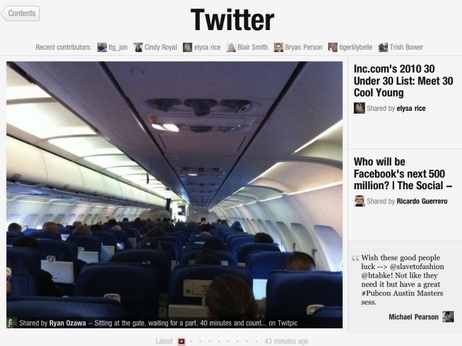 The ability to absorb information at the speed of social media is part of the reason why Flipboard acquired Ellerdale. And since Ellerdale has been working on semantic search for years, the technology will be ready for release soon. Once it has proven to work, Flipboard will expand its reach to include other social networks like Foursquare, Digg, Flickr, and Tumblr. Once that happens, we may finally be on the path to making rational sense out of the dozens of data streams that we deal with every day.